Hi ZenFone users! 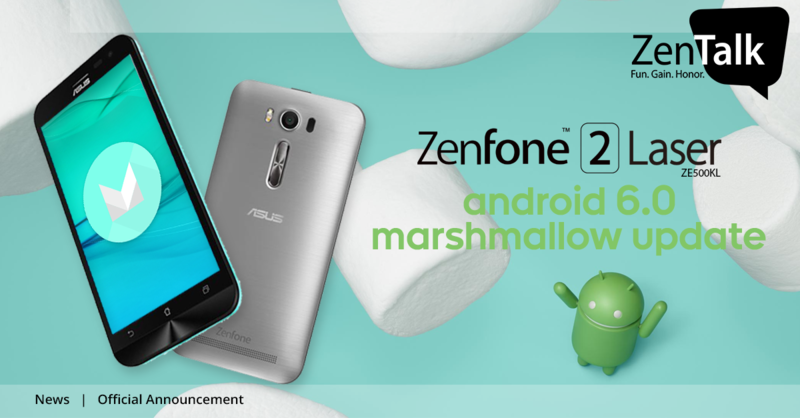 Good news as the Asus released the Android 6.0 Marshmallow to roll out via FOTA update for ZenFone 2 Laser ZE500KL (Laser 5-inch) today. Can download and enjoy updated apps like Google Camera. Removed floatware apps the is pre-installed in the Zenfone Android Lollipop version. (It will take about one week for the system to complete the autopush, if you do not receive the update prompt, then please go to【Setting】->【About】->【System Update】to update manually). Software update to Android 6.0 Mashmallow. Internal storage will decrease slightly after update, it is recommended back up data and relocate media files (pictures & vides) to SD card to reserve enough storage before starting the software update. The apps listed below will no longer be pre-loadeded once your device has been upgraded to Android 6.0 (Marshmallow). This update will remove ASUS Email, ASUS Calendar, ASUS Messaging, and won't be preloaded in this software version. You can use GMail, Google Calendar, Google Messenger for relevant services.